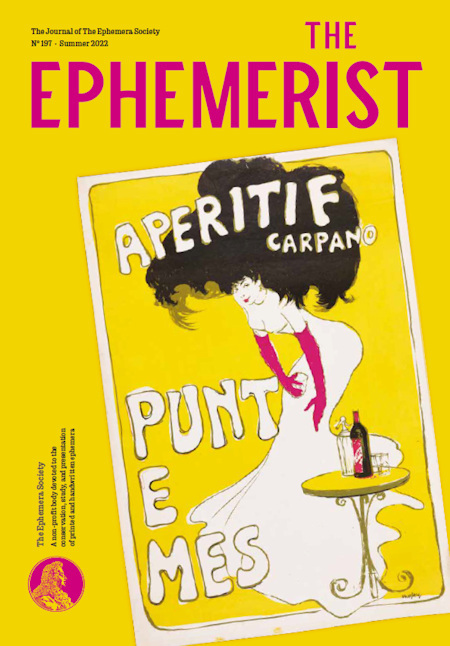 The Spring issue of the society’s journal “The Ephemerist” was posted to members on 15 April - look out for yours in the post over the next few days. Both the articles on Eastern Bloc matchboxes from the 1950s–80s and fez labels of the early 1900s featured in this Spring issue of The Ephemerist 184 are examples of factories that are seeking to differentiate their products by offering something extra — namely an attractive package that features some of the best illustrators of the day. Why not become a member today? A year’s membership of The Ephemera Society entitles you to four issues. Join us! The Ephemera Society is always pleased to welcome new members. Payment can now be made online via PayPal. The Centre for Printing History and Culture in conjunction with Print Networks and Liverpool John Moores University is organising a conference entitled Dregs, dross and debris: the art of transient print. An opportunity to take a fresh look at the printed material too often regarded as trash - either by its contemporaries, who regarded it as disposable, or by the academy which until recently has tended to treat such items as beneath contempt. More infortmation visit the Centre for Printing History and Culture website. This book about the history of the passport is for a general audience and also provides valuable knowledge on passport collecting as a leisure activity. Containing an overview of roughly 500 years of passport history, with insights on selected, rare examples of travel documents from the past including extinct countries along with fantastic stories and astonishing passport photos. Furthermore, there is an insight into the value of old passports, including the most highly valued passport ever sold. The book has 353 pages and includes 182 pictures and is a vital source for interested readers and collectors alike. For more than the first century of formal medical education in America, medical schools were proprietary in nature. The faculty, a collection of independent entrepreneurs, collected fees directly from medical students and in return, issued them tickets for admission to their course of lectures. Medical lecture tickets dating as far back as the 1760s survive as physical evidence of this proprietary system of medical education. The tickets were meant to be ephemeral, a paper that admitted a medical student to a course on the road to becoming a physician, but unlike a diploma, nothing intended for longevity. Fortunately, a significant number of students kept their tickets as mementos and over time, a lesser but still significant number of those keepsakes survive in private and institutional collections, much to the delight of archivists, scholars, medical historians, interested physicians and others with curiosity. As with all artifacts, medical lecture tickets essentially tell stories about people. Professors who issued the tickets and medical students who purchased them were individuals of diverse medical, historical, military, cultural and human interest and accomplishment. This catalogue unfolds nearly 200 of their stories from 100 tickets selected from the vast ticket collection of the University of Pennsylvania Archives and Records Center.